Paraglide Costa Rica, the Ultimate Canopy Tour! Come join Paracrane on a paragliding tour to Costa Rica this spring 2019. The 10 day tour will be February 11-21. All hotels are covered including the last night after flying on the 21th. We lead small groups to a variety of wonderful flying sites from Mount San Miguel, Jaco and Caldera to Escaleras de Dominical to Fox’s Leap. 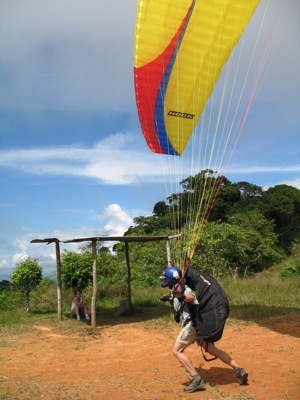 While paragliding in Costa Rica is always an adventure, it's great whatever your skill level. 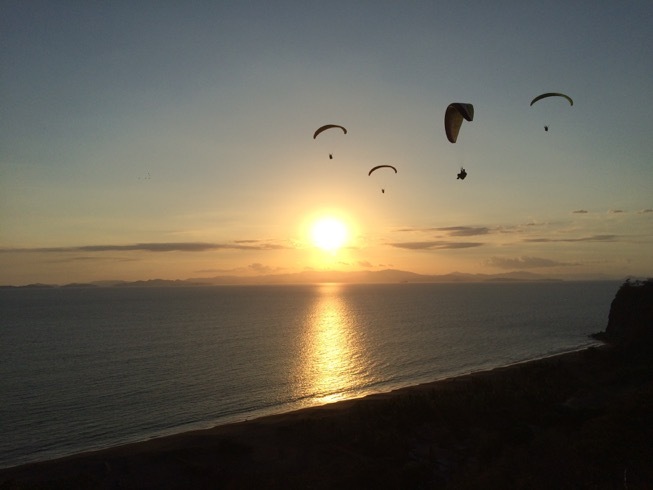 Your tour leader is Nick Crane, USHPA Advanced Paragliding Instructor and Tandem Instructor. While most launches are a 2-wheel drive up, some require 4-wheel drive, so we are always prepared to access the best sites to paraglide Costa Rica at the optimum times with the best equipment. Because we know the area, and we always have a small group, we are flexible in our flying plans. This year we have expanded the tour to 10 flying days to explore more of the amazing Costa Rican paragliding sites. Nick has pioneered or co-pioneered 5 of the best sites in the country. You will fly the best sites in the most optimal conditions. You will have access to many private sites not available to traveling solo pilots. While Mother Nature has no guarantees, we fly virtually every day. The past 3 years we have had between zero to 2 no fly days in a 3 months! Most tours start in the Caldera area, with 6 great sites within a 10 to 45 minute drive. Then we travel to Dominical, 3 hours south of Caldera for a 3-4 days, one of the most beautiful flying areas you'll ever experience, with 4 sites and more we develop each year. You can fly every day for hours, or take a break for a day or an afternoon and explore a cloud forest, go rafting, surfing, take a Spanish lesson, or chill at the beach. The areas you will visit are remarkably diverse, with some dry forested cliffs with cactus, mixed tropical forest and lush rain forest. You will see iguanas, monkeys, pelicans, frigate birds, hawks, eagles, vultures and crocodiles (from a bridge!) and often macaws and toucans. Most sites are P-2 friendly depending on conditions, with plenty of fun and challenge for experienced pilots. You will be flying both oceanside soaring sites and inland thermal sites. The soaring sites give you a great opportunity to hone soaring skills and practice top landing as well as a chance for experienced pilots to do maneuvers over the water. The inland sites give you a chance to refine thermalling techniques, active piloting and fly cross country. Every year we pioneer new sites in Costa Rica. The spring 2008 season saw the development of a great mountain site, "Lobo's launch,"with fine XC potential, and 5 different LZ's. The local community has been extremely supportive, and invited us to fly during their annual local fiesta. There was even a guy who's sole job was to halt all fireworks during paragliding approaches and landings! In 2009 we vastly improved the launch at one of our favorite sites, Danny Mann's, and we started flying a new site on the Nicoya peninsula at Lepanto. 2010 found better access to Parrita, one of our favorite advanced sites, and return to Rana Roja, and 2011 Nick pioneered 2 new sites to the south, 3500’ vertical site at Dos y Media, near the Panama border. In 2013 and 2014 we pioneered flying “Salto de Zorro”, or Fox’s Leap, with numerous XC flights of 15-30+ km heading both north and south. My driver Carlos saw an ocelot or “manigordo”on his drive down, and we saw a puma or mountain lion on another trip up to launch. Many paragliding sites in Costa Rica are privately owned and are accessible only with a guide. You will have unique access to all the great sites on a tour with Paracrane. We work hard to maintain good relationships with land owners, as well as contributing to local causes, like the small local school near Dominical. We urge all visiting pilots to respect sensitive flying sites wherever you fly, especially Costa Rica! FOOD & WATER A typical Costa Rican breakfast is a hearty combination of rice and beans, called pinto, with your choice of eggs, bacon, tortillas or toast, at a local soda (Costa Rican cafe). Lunches we usually grab on the go, such as fresh fruit or snacks. We usually share a relaxed dinner at one of several local restaurants, where a great locally caught fish dinner and a beer is around 10 bucks. You CAN drink the water, it's treated in the whole country, but in some places the bottled water tastes better. Book your flight to arrive at the San Jose, Costa Rica airport on or before Feb 11. We will have a reservation for you the night of Feb 11 at a nearby hotel and will meet you there the following morning. Book your departure for the day after the last flying day February 21rd. Again you will have a reservation at a local hotel and can plan to leave February 22th or later. All hotels from Feb 11 thru the night of Feb 21 are included in the tour! Prices are $2600 per person, double occupancy ($400 extra for single occupancy) Non-flying spouses are welcome at a discount rate. All transportation in Costa Rica, all lodging including the hotel after the final day of flying, guiding and coaching are included. Come join us paragliding in Costa Rica. Nick is west coast importer for Niviuk Paragliders, and Apco Paragliding Equipment, as well as Costa Rican Ozone Importer, so if you're itching for a new wing, let's talk! Join us for the ultimate canopy tour, to paraglide Costa Rica. For more information and call Nick at 541-840-8587 or email us at nick@paracrane.com to join our mailing list!